Specialized knowledge of how young children develop and learn is critical for those who work in early care and education. They need access to opportunities for ongoing education and development. The Florida Early Care and Education Professional Development System helps support the state’s highly qualified early learning workforce. Florida’s early care and education professional development system is a framework with four key elements that define pathways tied to credentials, certifications, and qualifications to meet the needs of individual adult learners in the field. The website for ordering printed copies of The Educator’s Guide to Understanding the Florida Early Learning and Developmental Standards is available online, click here. 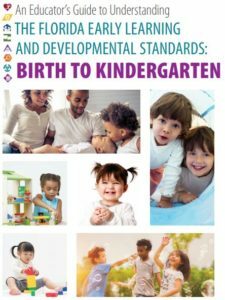 The Educator’s Guide includes a developmental progression of the standards: birth through kindergarten, examples of the standards in action as well as environmental considerations, information on how to use the standards with diverse learners and much more. Resources and tools designed to help early childhood educators earn credentials and degrees can be found on Early Educator Central, a joint effort by the U.S. Department of Health and Human Services, Administration for Children and Families, Office of Child Care, and Office of Head Start. The National Association for the Education of Young Children has created Online Learning modules with early childhood educators in mind. The modules include a variety of topics designed to provide practical tips and strategies you can bring to the classroom. The modules are approximately one hour in length, self-paced (pause and start back up at your convenience), interactive and based on knowledge and research of the early childhood field. A Child Development Early Intervention Certificate has been adopted as an Early Care and Education Advanced Credential option. Nine state colleges currently offer the Child Development Early Intervention Certificate. To download the list of institutions currently offering the certificate, click here.